Hammond Stadium has an amazingly itneresting outer facade that is reminiscent of Churchill Downs or some some sort of plantaion home. I can't exactly expalin it, so I included a picture at the bottom. It is quite unique, and I have never seen anything else like it at any stadium. Hammond Stadium also has a gorgeous, foundation with cascading levels outside of the stadium. Many people like to get their photographs taken here. Again, it is truly unique and I have never seena nything else like it at any other stadiums. 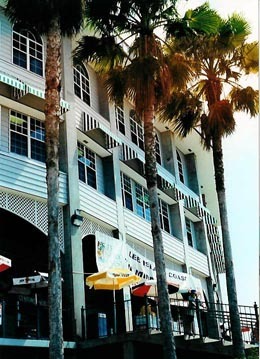 Short of those two amazing structures, there is not too much to say about Hammond Stadium. It's food is average, and there is nothing else structurally unique about the stadium. The fans don't seem as passionate as other fans I've seen, but that may start to change given the Twins recent success. Hammond Stadium is pretty much your basic Spring Training facility. I would definitely recomend that you visit the stadium if you are in the area, but unlike Dodgertown, which is worth an extremely long car ride to get to, I would say it is not worth going out of your way to Ft. Meyers to see Hammond Stadium. "I've been the last couple of years. This is a great place for sigs. First and foremost, this is a small market team that doesn't generate as much fan interest, so the competition for autographs isn't like at Legends Field. The players actually seem glad that you have come to see them play. I got about 8 or so Twins on a ball at one game last year. I also got Paul Molitor to sign a ball. He even signed on the sweet spot without my having to ask him. Two years ago, I went down before they started playing games and visited both Minnesota and Boston. Both practice at minor league sites where individual fields are surrounded only by a chain link fence. For players to walk from one field to the other or to the locker room, they must walk among the fans. So you can just walk right up to them. Bret Saberhagen and Tim Wakefield were especially accomodating at the Red Sox site. At the Minnesota site, they were all great. Here's an example: I was watching Coach Gardenhire run catcher drills on a side field. I was standing outside the field taking some video and chatting with him. He actually invited me to come into the bench area so I could get better video without the chain link in my way. It was great!" You may want to go here, the website of the Fort Myers Miracle baseball team, to view interactive panoramic images of the stadium so you can make your own judgement. 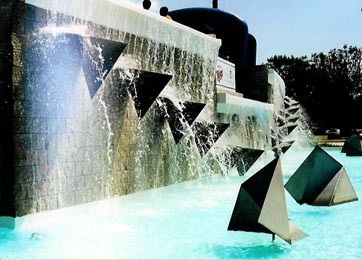 A beautiful fountain, which is truly unique. 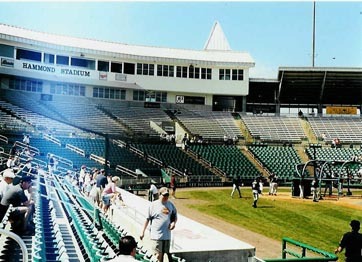 The field at Hammond Stadium is very well kept, and the stadium is always very clean. What an amazing exterior! The field is obviously on the lower level, and in the rooms above the stadium are offices and luxury suites. No other stadium has an appearance quite like this one. Autograph tip: when I went, it seemed that the players were not extremely generous with the autographs before the game. After the game, they were more than willing to sign for the fans. Find where the home players parking lot is, and try to get their signatures as they leave the stadium. I was fortunate enough to get Twins closer Latroy Hawkins this way. And all the Twins seemed to really enjoy signing for little kids.